It’s October and chilly nights–some already down below 40 degrees in the Pioneer Valley–are getting to be a regular occurrence and the farmers’ plans are shifting toward frost protection. The storage crops are being brought in and their fields planted down in cover crops. Some veggie crops, though, like leeks and celeriac will sit tight in the soil into November, and pulled fresh for the share distributions. Riverland farmers Meghan and Rob and their staff just finished their last field planting, putting in some lettuces. They’re headed into the high tunnel (unheated greenhouse with plantings in the ground) to continue some planting that will be good for harvest into December, thanks to the tunnel for protection. Some of the more frost sensitive crops still thriving out in the field will also last a while longer thanks to long white row cover “blankets”, which make for a longer season but also more time-consuming harvests. 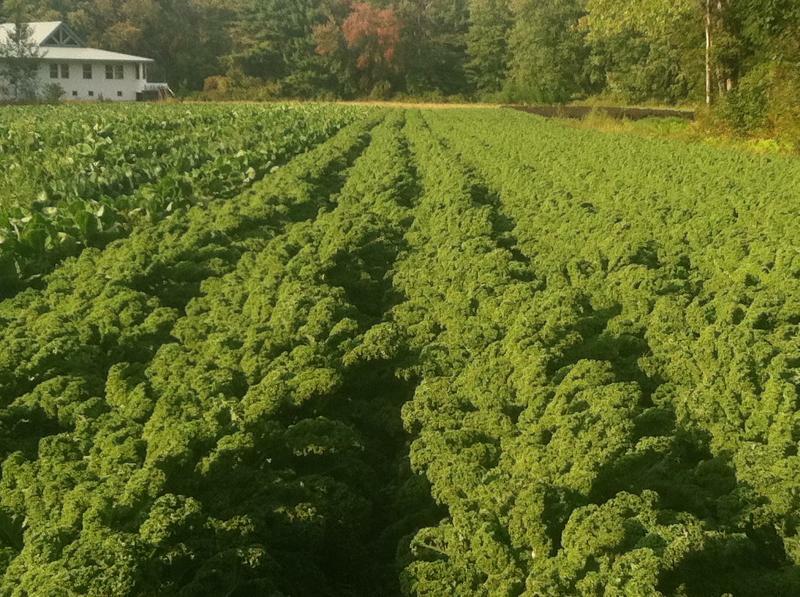 And then there’s the sea of curly kale at Riverland. You can order this beautiful bounty by the 1/2 bushel box as an Extra with your October pickup (more about Extras below). This week, Picadilly Farmers Bruce, Jenny, and their core staff have just about said goodbye to the weeding (and for now, a fond farewell to the folks who have staffed their 2012 weeding crew, too) and begun the sweet potato harvest. Should be wrapped up this first week of October before the real cold settles in. Sweet potatoes are actually a tropical plant and so do not ever like the cold! Both Picadilly and Riverland say it looks like a good year for those sweeties. For our household each year, the sweet potatoes have been happy in a dry part of the basement, on top of our extra freezer, for months. It’s been great to have a nice supply on hand for a spontaneous snack of sweet potato fries for the neighborhood kids–I can feel good about it and everyone enjoys it. Sweet potato pies will grace the table soon enough, now’s the time for apple pie! This fall, we are among the lucky ones to actually still have a real apple crop. Cider Hill, our apple and cider supplier, was spared the devastating loss that most of Michigan and the Midwest—and orchards even just a few miles west of here as close as Harvard MA–suffered in the post-April-heat-cold-snap that froze most or all of the blossoms. Cider Hill is (as you might guess) on a hill, which is less likely to suffer frost, and also perhaps being nearer the coast helped as the ocean can mitigate extreme temperatures a bit. So, even though other local orchards have had to close their pick your own weeks ago, there is still apple picking at Cider Hill– take advantage of tasting some (or all?) of their 16 varieties this week and free hayrides on the weekend. Accompanying our usual savoring of apple pies and cider in the coming weeks will be unusually high gratitude! Apples will be part of the November share boxes, and we’ll again offer bulk apples and cider for November Extras. In December, Extras will include bulk beans from Charley Baer, bulk veggies from Riverland and Picadilly, eggs, honey from Warm Colors in Deerfield, and perhaps a few new items. Goat cheese and Mozzarella cheese from two local producers will also be part of the Extras for each pickup. And of course, Maple Syrup from the Warren Farm, and there’s another story of gratitude and blessings despite the odds, but that’s for another post. It’s time now for ordering Extras for your October pickup. You’ll find more info about that in an email to shareholders.